Love Dolphins? Another reason to hate whales!! Killer whales are driving pods of dolphins into tight bays and EATING THEM. Watch a video of it here (which is also the source article). The video is boring – I want a close up of a whale chewing into a dolphin. MOSCOW – Russian Prime Minister Vladimir Putin fired darts from a crossbow at a gray whale off Russia’s Far Eastern coast on Wednesday in the latest in a series of man-versus-nature stunts designed to cultivate the image of a macho leader. “I hit it at the fourth try!” a beaming Putin, kitted out in black-and-orange waterproof suit and black beanie, yelled to a camera crew from the boat. 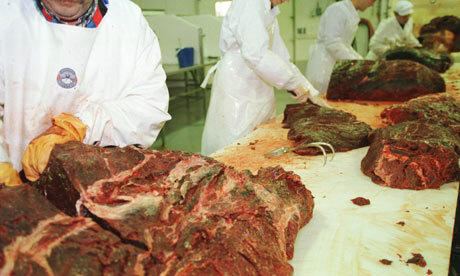 A biologist with him displayed the skin sample and said it would allow experts to determine where the whale came from. When the boat skidded onto the beach, a bouyant Putin hopped off and made a beeline for waiting reporters. Clearly in his element, Putin replied jovially to a question as to whether the endeavor was dangerous. During his eight years as president and during the past two as prime minister, Putin has learned to use television to cultivate the image of a rugged leader beloved by the Russian people. CAPE TOWN, South Africa – A yachter in South Africa says her trip off the country’s picturesque southwestern coast was wrecked by an unexpected whack from a whale. 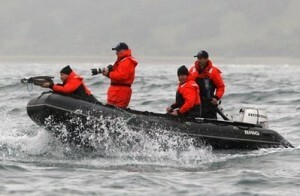 Paloma Werner said Wednesday the whale breached just feet (meters) from their boat in Cape Town’s waters on Sunday. It whacked the yacht, snapping the mast in two. A local newspaper showed a photo, captured by a passenger on a nearby boat, of a massive black whale towering over the yacht. Werner says neither she nor her companion were hurt, and she saw the whale swimming around minutes after the collision. She says she feels lucky that the mast took the brunt of the blow. Now, you might be thinking “what do you have against dolphins”? 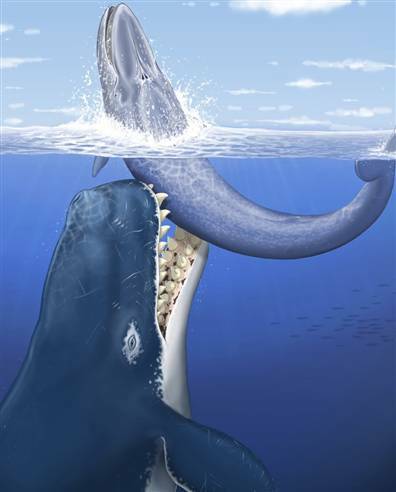 I used to have NO problem with dolphins.. until I read that they can mate with whales, resulting in WOLPHINS! No joke. I read it on Yahoo. It must be true. 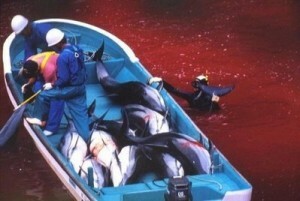 So because dolphins can help perpetuate the whales, they fall into the ‘anti’ bucket. Apparently Amazonian river dolphins are being caught and and their flesh used as bait. Yanno.. people that live there.. first you destroy your rain forest, now you get rid of your river dolphins. I’m all for the latter, but really? You are going to run out of natural resources and that makes me sad, because you have some really unique natural resources. Finally! Japan convicts an anti whaling activist for throwing rancid butter at Japanese whalers. Dang, maybe he should have refrigerated that butter and used it to braise some fish for eatin’. I bet whale tastes good with butter. Everything tastes good with butter! Also, the article notes that ” Japan has said the leader of Sea Shepherd, Canadian citizen Paul Watson, 59, is now on an Interpol wanted list for allegedly ordering Bethune’s actions as part of the group’s disruption of Japanese whaling in the Antarctic.” Fierce. At least 600 delegates from 80 countries have involved in a showdown between pro- and anti-whaling nations. The IWC compromise proposal was to allow Japan, Norway and Iceland to continue commercial whaling for another decade, despite a global ban. Yet, negotiations fell apart on the compromise proposal despite an unprecedented decision by the IWC to hold the discussions behind closed doors, shutting out civil society and media personnel.